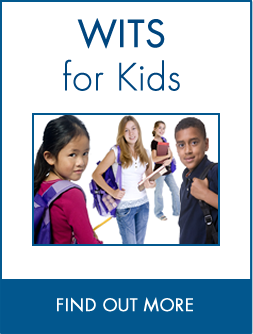 The WITS Programs bring together schools, families and communities to create responsive environments that help elementary school children deal with bullying and peer victimization. There are two components of WITS: the WITS Primary Program for students in Kindergarten to Grade 3 and the WITS LEADerS Program for students in Grades 4 to 6. Both have a literature-based curriculum designed to integrate with existing learning objectives. Community leaders, including police officers, firefighters, paramedics and Elders, as well as high school and university athletes, are key participants in several components of the program. They launch the WITS Primary Program with a Swearing-In Ceremony where students are deputized as WITS Special Constables and the WITS LEADerS Program with a special skit called the Tug-of-Help. These community leaders also make school visits throughout the year. How much do the WITS Programs cost? There is no charge to use the WITS Programs. There are no fees to pay and almost all of the WITS Programs resources are available free-of-charge on this site. You can download the full resource guide, as well as individual lesson plans, complete online training, watch videos and print off posters and pamphlets. Only the WITS Books and reminder gifts are not available from our site. Because our book lists feature popular children’s books, however, most schools already have many of the titles in their school libraries. We’ve also provided suggestions on how to cost-effectively obtain these additional resources here. How can I get the WITS Programs started in my school? Schools that are interested in the WITS Programs should check out Implementing the WITS Programs: A Step-by-Step Guide for Schools. This easy-to-follow document suggests 10 steps to get the programs off the ground and sustain them throughout the school year. What is the difference between WITS and WITS LEADerS? The WITS Primary Program (Kindergarten to Grade 3) teaches children to make safe and positive choices when faced with peer victimization, by teaching them to “Walk away, Ignore, Talk it out, and Seek help.” The program is implemented in the school environment, and is designed to integrate with existing learning objectives. While reading books to students, teachers can build in questions and activities that link WITS messages to the story. Community leaders, such as emergency services personnel and university and high school athletes, also get involved through school visits. This makes WITS a truly community-based program. The WITS LEADerS Program (Grades 4 to 6) teaches students to resolve peer conflicts peacefully by considering others’ perspectives and using problem-solving skills. 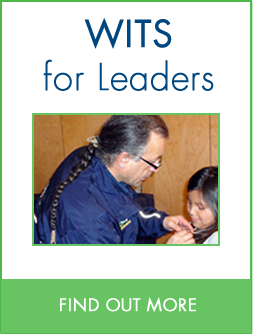 The LEADerS acronym stands for “Look & Listen, Explore points of view, Act, Did it work? and Seek help.” The program includes five training sessions teachers can use to teach students these important problem-solving skills. They’re also taught to be WITS LEADERS — people younger students can turn to for help when they are faced with conflict situations. Like the WITS Primary Program, the WITS LEADerS Program has a literature-based curriculum that integrates easily into existing learning objectives. How do you know the WITS Programs make a difference? Two longitudinal evaluations of the WITS Programs have been conducted. The first efficacy evaluation (2001 to 2006) followed 430 children and their families and collected four waves of data (Leadbeater et al., 2003; Woods, Coyle, Hoglund & Leadbeater, 2007). The second (2006 to 2008) involved 1,130 children, their families and teachers across three waves of data (Leadbeater, Sukhawathanakul, Yeung & Desjardin, in preparation). These studies show that, compared to children in control schools, children in schools with well-established WITS Programs report more physical and relational victimization. This is consistent with the WITS Programs’ aim to encourage children to report victimization or ‘Seek Help’ and suggests program school children are capable of identifying victimization episodes and reporting them. Findings also showed that rates of physical victimization declined significantly faster in program schools compared to control schools. In addition, the second study showed that teachers in program schools consistently rated children’s levels of social responsibility higher than teachers in control schools. Check out our Research and Evaluation page to learn more about research and evaluation related to peer victimization and the WITS Programs. What is the Swearing-In Ceremony? Community leaders help launch the WITS Primary Program in September or early October with a Swearing-In Ceremony where students in Kindergarten to Grade 3 are deputized as WITS Special Constables — people who pledge to use their WITS when faced with teasing or bullying. It includes reading students a WITS story, teaching them important WITS Special Constable skills like standing at attention, saluting and the secret handshake and password. Students also pledge to use their WITS and are presented with a special badge to remind them of this pledge. Learn more about the Swearing-In Ceremony here or check out the WITS for Kids section for a Swearing-In Ceremony that kids, whose schools don’t yet offer the WITS Programs, can do at home. How do storybooks and novels integrate with the WITS Programs? The recommended stories provide an opportunity for children to observe and discuss challenges that the characters face when dealing with conflicts. 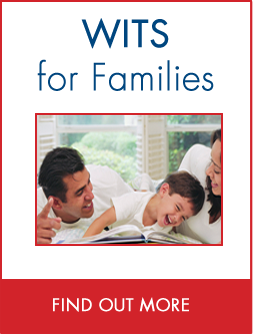 Each story includes a detailed lesson plan that suggests questions and activities to help children explore WITS strategies and discover ways to adopt these strategies to resolve conflicts. How much of a time commitment do the WITS Programs require? The WITS Programs were specifically designed to make a large impact using as little time or resources as possible. For teachers, its book-based curriculum should integrate easily into existing learning objectives. 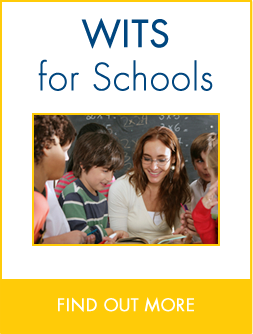 Teachers can select stories from the WITS Book Lists to read to their students and use suggested questions and post-reading activities in the WITS Lesson Plans to reinforce WITS messages. Teachers can also identify teachable moments: when children experience peer conflict, for example, discuss how using their WITS might solve the problem. For community leaders involved in the WITS Programs the total time commitment is about 10 hours per school per year — approximately one hour per class spread out over five to 10 visits. Optimally, a community leader will visit classrooms once a month during the school year, but can also choose to make presentations to large groups of students in an assembly-style format in order to communicate with multiple classes simultaneously. Where are the WITS Programs currently used? The WITS Programs were created in Victoria, BC but have now spread to approximately 300 schools in NB, Newfoundland, Nova Scotia, Ontario, Manitoba, Saskatchewan, Alberta, BC, Yukon and the Northwest Territories. To get a better idea of just how widespread the programs have become, check out the WITS Map. Where can I learn more about bullying and peer victimization? The website also provides information about research into bullying and peer victimization by WITS Principal Investigator Dr. Bonnie Leadbeater. Check out the Research and Evaluation section for full details. Have a question that’s not answered here? Please contact us for more information.